Engaging our jobs intelligently and without resistance does not require that we redefine our entire approach to our livelihood. We can engage our jobs sanely and openly without giving up on success or disregarding our feelings or ambitions. What is required is surprisingly ordinary: simply to be who we are where we are, to subtly shift from getting somewhere fast to being somewhere completely. 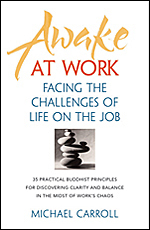 By taking such an approach, we discover not only a larger view of work but also a basic truth about being human: by genuinely being ourselves in the present moment, we naturally become alert, open, and unusually skillful. Awake at Work, page 7.